The Pro Blu Mamba Disposable Latex Gloves BX-PLB are heavy duty latex gloves designed to offer a great level of chemical protection, ideal for situations where standard gloves aren't tough enough. Made by the same people who brought you the class-leading Black Mamba gloves, the Pro Blu Mamba gloves offer a fantastic level of protection in a latex glove. 50 gloves are included in each box of the Pro Blu Mamba Gloves. 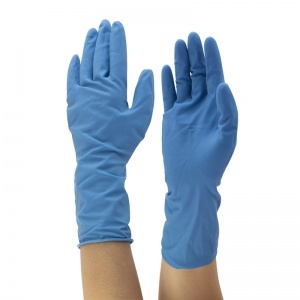 The blue colour of the Pro Blu Mamba gloves makes it easier to see certain chemicals and solvents, helping you know if the glove is safe to continue using. This is vital in laboratories where chemicals can become contaminated, helping to reduce this risk of tests failing. Made from heavy duty professional-grade latex with a thickness of an incredible 14 mils, the Pro Blu Mamba Gloves are incredibly tough, helping you keep your hands protected for longer. What's more, the gloves also feature a 12 inch cuff, helping to keep wrists as protected as hands. To help provide even more ease of use, the gloves are also fully textured with a textured grip, giving them an incredibly high level of grip and making it easier to hold objects for longer periods. They also utilise the EZ Glide donning system, making them incredibly easy to put on and take off. The Pro Blu Mamba gloves offer an increased level of chemical protection compared to Mamba nitrile gloves, making them suitable for use with ketones, including Methyl Ethyl Ketone (MEK) and Acetone. The Pro Blu Mamba Disposable Latex Gloves BX-PLB are available in three sizes designed to fit most individuals. Measure the width of your hand from one side of the palm to the other, excluding the thumb and fingers. Please note that to ensure the highest level of quality for our customers, the Pro Blu Mamba Disposable Latex Gloves BX-PLB are not suitable for return. If you are unsure about the suitability of these gloves for your purpose, please check with our customer care team on 020 7501 1104 prior to purchase.